At Hot Shot Bags, we believe travel should be fun. We take pride in making stylish, high quality, and yes, fun backpacks that you can rely on. This HOT SHOT BAG is perfect to be used as a Travel Bag. It can also be used while Hiking & Trekking, Rucksack bags . It’s a Large sized sports bag with multiple compartments and pockets. This lightweight & voluminous backpack comes with multiple organized compartments that make it perfect for your college/office or as a carry-on for that weekend trip. Made of durable double dot polyester fabric, this backpack is equipped with 2 full compartments and 1 front compartment, to hold enough notebooks, textbooks & journals for your clothes & additional supplies for a day or two of travel. It has an internal organizer that provides easy access to your wallet, phone, charger, stationery, keys or whatever you need on the go and still has ample space left for your headphones, your personal diary or the novel you're reading on your commute. It has padded mesh back & shoulder straps with a breathable system for better back support. It comes with a rain cover and has an adjustable double padded handle for back comfort. Sternum straps, compression straps, Ice as loops, drawstring and zip closure makes it more utilitarian. 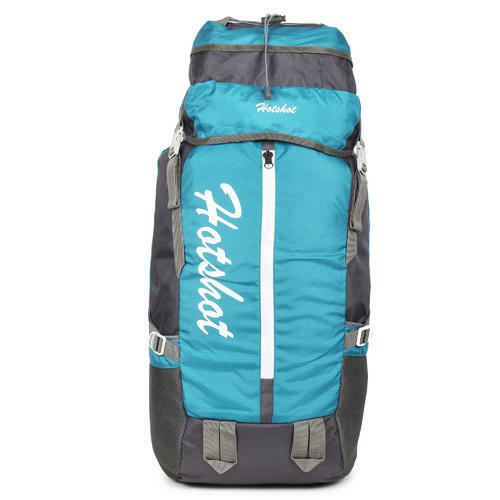 Travel in style with this stylish rucksack by HOT SHOT BAG. HOT SHOT BAG strives to supply the best possible products for our customers. This Bag has 1 year warranty. Marking our presence in 100+ countries making it the most preferred luggage brand worldwide. This lightweight & voluminous backpack comes with multiple organized compartments that make it perfect for your as a carry-on for that weekend trip. Made of durable double dot polyester fabric. Protect your bag from rainy weather or dust with a lightweight, packable rain cover that's made with an adjustable elastic closure for a secure fit around your backpack. Each backpack passes a series of rigorous global quality tests by Hot Shot Bags touristed. This Bags are available in reasonable prices. Here are so many varieties in colors, styles, range and fabrics. When you'll used our product, we assured that you'll be happy.